In fairness to BOFI, the key word here is “baffling” since the laws governing U.S. corporate disclosures have few bright lines and a great deal of murkiness. As Steven Davidoff Solomon noted in an New York Times column, the Supreme Court upheld in 2011 a previous ruling that if “disclosure of the omitted fact would have been viewed by the reasonable investor as having significantly altered the ‘total mix’ of information made available,” a public company’s failure to reveal certain information is considered “material” and could potentially subject it to civil and criminal investigation. Left unsaid is the fact that companies may have their own opinions on who’s a “reasonable investor” and what he or she might consider “significant.” Hint: Companies often find ways to claim news that would prompt probing phone calls from investors and reporters isn’t significant enough to merit disclosure. So, for example, Valeant Pharmaceuticals International went out of its way to tout its January 2013 hiring for its executive management team a former Medco Health executive Laizer Kornwasser. Valeant listed him on the company’s proxy statement and gave him a wide-ranging mandate, including oversight of its new relationship with a company called Philidor Fulfillment Services. When Kornwasser left in July 2015, however, the company didn’t say a word. Accountants have long used a rule of thumb that if not the law is widely accepted as a fair guideline for materiality: If a company misreports a metric by more than 5 percent, that’s material and should be disclosed. These already muddy waters turn pitch black when it comes to a company’s obligation to disclose regulatory investigations, said Tom Sporkin, a former Securities and Exchange Commission supervisory official now in private practice at Buckley Sandler LLP. Sporkin, whose father Stanley Sporkin was a former SEC chief, added that the SEC tends to avoid weighing in on this issue apart from when “the public interest is clearly served,” such as in the case of a breach of a credit card company’s sensitive consumer information databases. So BOFI has a great deal of latitude about what it can tell investors. Some of the issues the bank’s management seems to think investors needn’t be bothered with are at least two regulatory probes. An investigation does not suggest that the Treasury’s inspector general’s staff — which often works with the Department of Justice — would conclude any wrongdoing occurred. 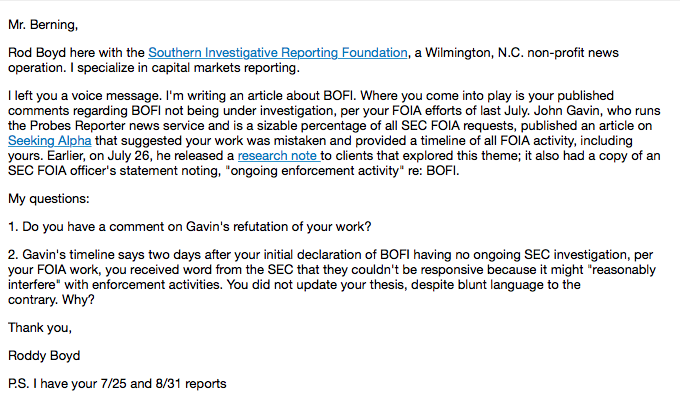 As of publication, BOFI had not responded to a request for comment. In March the New York Post reported that the Office of the Comptroller of the Currency, BOFI’s primary regulator, is investigating whether foreign nationals had the proper tax identification prior to obtaining loans from BOFI. The bank’s chief legal officer, Eshel Bar-Adon, referred to the Post report as “silliness” and said the company’s CEO Gregory Garrabrants had previously addressed these allegations. The bank hasn’t been charged with any wrongdoing. Ordinarily, Gavin said in an interview, he would have been content to leave it at that. But he saw, via another FOIA request, how BOFI executives were using FOIA to learn the identities of other individuals seeking information on the bank. On Aug. 30 Gavin posted an article on Seeking Alpha correcting assertions by BOFI CEO Garrabrants and Brad Berning, an analyst with Minneapolis-based brokerage Craig-Hallum, that market chatter about a possible SEC investigation of the bank was groundless. A few months ago, on Feb. 28, Gavin released a report asserting his findings of an ongoing investigation. To be sure, as both Gavin and Berning observed, most SEC enforcement probes are closed without any action being taken. BOFI’s disclosures about the nuts and bolts of its operations aren’t much more substantial than its sharing of regulatory probes, although the hush is stranger because the bank appears to have excellent financial results. Consider FICO scores, the ratings system of credit strength for borrowers that’s a standard feature in the discussion and analysis of every bank’s lending operations. If a bank has a sizable amount of loans with lower FICO scores on its balance sheet, smart investors need to closely watch reported delinquencies and loss reserves. BOFI has an unusual FICO disclosure policy. The borrower information available for its small but rapidly growing portfolio of automobile and recreational vehicle loans is a model of clarity, telling investors the average FICO score and how much has been set aside to cover possible losses. As of March 31, BOFI had a little more than $131 million of these loans on its balance sheet. On the other hand, BOFI doesn’t break out borrowers’ FICO scores for its $3.8 billion worth of single-family home loans. What the bank does disclose, in a veritable river of impressive-sounding mortgage industry jargon, is only marginally helpful in assessing the risk these loans pose to its balance sheet. Make no mistake: The single-family home loans Garrabrants referenced carry fine FICO scores, but the vast majority of them were probably sold off to the giant mortgage guarantors, Fannie Mae and Freddie Mac, generating profit for BOFI. It would not be surprising if some of the jumbo loans had been sold off to Freddie and Fannie or another banks. In other words, the FICO scores the bank tells investors about tell them the least about balance sheet risks. Many of BOFI’s direct competitors, EverBank and HomeStreet Bank, for instance, disclose the FICO scores of loans kept on their balance sheet. Even Wells Fargo, a vastly larger competitor that’s recently gotten in truly hot water for other things, spent a whole page of its annual report breaking out its borrowers’ FICO scores. Tamara Taylor, a BOFI spokeswoman with Sitrick & Co., said the bank doesn’t disclose FICO scores on its portfolio of retained loans because its officials “aren’t required to.” She said that BOFI’s filings break out loan-to-value bands on its single-family loans. One of the ironic consequences of BOFI’s weak disclosure practices is that this has breathed life into its own worst enemy: a small group of anonymous short sellers who plague the bank on Seeking Alpha and on Twitter. If BOFI had been more forthcoming, they wouldn’t have been as likely to spend prodigious amounts of time and money to surface what they argue is material information that the bank didn’t want released. Garrabrants briefly alluded to this controversy in an August 2015 New York Times article, arguing the foreign lending business line was “nowhere near the majority” of the company’s loans. A formal disclosure about these type of loans came only two and a half years later during an April conference call, when Garrabrants said that this program now amounted to “15 percent of its jumbo mortgage production.” BOFI didn’t provide a dollar value for this business on the call and refused to answer the Southern Investigative Reporting Foundation’s questions about it. In August 2015 another short seller “The Friendly Bear” posted an article claiming that BOFI was doing business with at least one broker who was pitching loans to residents of U.S. Treasury-sanctioned nations like Ukraine and Russia; the author suggested he had reviewed several loans made to residents of these countries in state filings. Garrabrants, in the 2015 Times article, said that no regulators had raised concerns despite multiple reviews of his bank’s operations. This past April, he told investors and analysts that the foreign loans were of excellent credit quality and that the bank hadn’t sustained any credit losses from them. BOFI declined to answer more specific questions about this business. 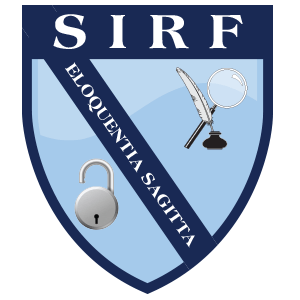 The Southern Investigative Reporting Foundation located 40 mortgages from BOFI to Russian and Ukrainian nationals for New York City and Miami properties. Another 36 Chinese nationals were identified as BOFI borrowers, primarily for properties in Southern California. One of the more interesting borrowers was Vadim Shulman, a Ukrainian national and alleged billionaire who took out a $12.5 million five-year adjustable rate loan in September 2014 from BOFI at a 5.25 percent interest rate to purchase a stunning house in Malibu for $25 million. For a man who’s that rich, the loan is an odd move, costing Shulman about $237, 324.80 a month, and the rate will rise to 8 percent in September 2019.